I felt I had to comment on political blogger Paul Staines (AKA Guido Fawkes) attempt at climate change denial today as it shows how many on this side of the atlantic are falling for the ssame spin as US presidential hopeful Rick Perry, who recently came out as a climate change denier. it now seems standard for those of the right to be opposed to action on climate change. I can see how Perry might gain from this (his campaign is funded in part by oil companies), but Guido? Who knows, but one thing is sure - Guido is wrong. If you look at a map showing increase or decrease in temperature over the past 30 years you will see that the UK has stayed about the same and some parts of the world have got colder, BUT temperatures in Africa and some other areas have increased dramatically. This has reduced growing seasons. Overall temperatures ARE increasing and this IS affecting some of the poorest people in the world. An increase of one degree here would signify a change of much greater proportions nearer the equator. Pointing to snow here as a way of denying climate change is cold comfort to subsistence farmers living in these areas. 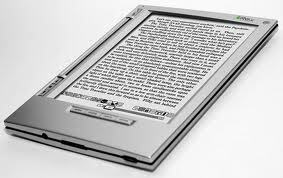 A web application for reading ebooks without software. On visiting the site you are presented with two options, either to upload an epub file or read one that resides somewhere on the internet. Many web sites that provide free ebooks show a link for downloading the file. Right clicking on this should allow you to see and copy the link address and out this into Magicscroll. There is an option to turn on online synching. If activated, this allows the current page to be remembered. A cookie is used to store your recently read book titles which should appear as links on the front page the next time you visit the site. Visiting Magicscroll on a mobile device calls up a special mobile version. Once the book loads you will see icons on the left of the screen for book contents, full screen and other useful functions. When the Apple iPad first came out I was ambivalent about how useful a tablet PC would be. I already had a touch screen smartphone and the iPad apeared to be not much more than a larger phone. However, as time has gone by I have become more aware of people using iPads usefully in business for presentations, document viewing at meetings, typing notes and keeping up with business Twitter accounts. 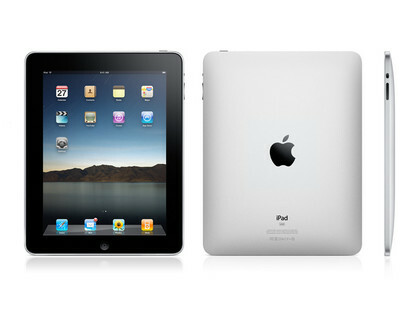 In home life I have used a friends iPad to view a rented movie, shop online and play music from iTunes. The iPad’s battery life is extremely good with 10 hours or more possible and it is very light. This takes it beyond a laptop and into a multipurpose device I could see myself carrying it back and forth to work for reading documents, viewing videos, listening to music or keeping up with my basic word processing needs. Other than music playing, these are all things that my mobile phone does not do particularly well because of the screen size and keyboard restrictions. My laptop can do them, and a netbook could too, but the netbook screen size and quality is not as useful as the iPad. Having used an iPad I can see the pluses and minuses. Regardless of what apple says about Flash, the lack of it means you can only access the BBC iPlayer and YouTube via applications which use other versions of the original files. You do not get the full web experience. We7 on demand streaming is not available without a paid account as the as supported version requires flash. Many web sites are not fully functional or more difficult to use without flash. My Android phone handles Flash perfectly well so I am left with the nagging suspicion that the lack of flash is more to do with the current patent war between smart phone manufacturers than any real technical or usability issues. The silliest argument used by Apple against Flash is that it is not open source, ignoring the fact that their own software is all proprietary. Safari works well, but new sites visited create new windows. Navigation would be a lot easier with a tabbed browser like Chrome or Firefox. I have not explored alternatives to Safari. There may be a solution to this. The original iPad has no front mounted camera making it useless for any video conferencing applications and severely limiting its usefulness for business purposes. The iPad 2 does have a front mounted camera, but as Apple were developing Facetime at the same time as the iPad it is nonsensical that the iPad did not have a front camera at its launch. This is more unforgiveable than the lack of flash because it was an in-house Apple issue. The iPad loks like a photo frame, but to view your photos you will be stung £25 for a “camera connectivity kit” which provides SD and a USB socket. In spite of this the USB socket will not allow the use of USB memory sticks because the power supplied by the iPad is too low. This seems like a deliberate way of forcing you to pay £100 for a version with more memory. I have an old Vodafone PAYG sim card with bandwidth that never expires. At £10 per GB its a very cheap way to connect to the internet. I thought I could use this in the iPad, but it uses a “Micro Sim” card which is smaller and has additional onboard memory. There are a few online articles showing you how to cut down a full size SIM card to fit an iPad, but its not clear if the iPad 2 looks for the SIM card’s memory for any purposes and cutting the card down will mean it can’t be used in my old Vodafone dongle. Some mobile phone companies will issue a replacement SIM card, but there is now way Vodafone will do this for one of the old style data cards that they make little money from. Given the Micro SIM issue ,the Wi-Fi only iPad would seem to suit me because my HTC phone is on a large bandwidth contract and a built in wifi hotspot. However, Apple decided to not fit a GPS receiver to the wi-fi only version which means there is no accurate location positioning (although approximate is available using wi-fi SSID’s and other information). They envisaged it as something you would use at home with truly mobile users choosing the 3g version. The other reason was that the 3g chipset used is the same as in the iPhone and it contains the GPS receiver, so adding GPS to the wi-fi version would have required extra development time. Android tablets come in a variety of qualities, from the very cheap ones with resistive screens, to ones like the Samsung Galaxy 10.1 which have lovely high definition capacitive screens. This means that developers do not know exactly what hardware they are building for so end user experience will be variable. This is the same disadvantage that Microsoft have over Apple with desktop and laptop systems. Apple control the hardware specification so they can predict how their software will behave. Microsoft have to make software that will work on an huge variety of hardware and peripherals. A visit to the Android Marketplace will show the same problem with variable performance of apps on the different available handsets. With the iPad, Apple have a stable, high performance platform through which they can guarantee to deliver a good end user experience. The Samsung tablets may be very well made, high performance devices, but try buying a case or a keyboard docking station. Its not going to be as easy or as well executed as the accessories available from Apple. The iPad is a very well made piece of equipment with a lot of thought having gone into things like the speakers (better than I would have expected) an the onscreen keyboard (which has a very positive action and is actually type-able on). However there is one reason why the iPad is better than ANY Android tablet and it is nothing to do with the comparative quality of the devices. The iPad has iTunes. This means you can download music, rent movies and buy apps very simply through an integrated system. It also has iCloud which allows music to be accessible from other devices and keeps it securely backed up. There is no integrated equivalent for Android tablets and there is unlikely to be because of the lack of uniformity of hardware. This was the reason that the iPod beat all other MP3 players. There were lots of very good MP3 players around before the iPod, but the iTunes software made it easy to synchronise the device and buy music. Similarly the iPad is a good video playing device, but it is also easy to get video onto. The same with music ebooks and apps. The iPad works. It might have its limitations, but they are well managed and it will not disappoint. Princes Street will be closed to buses from 3rd September 2011. The closure will be in place till June 2012. The main difference to previous closures is that The Mound will also be closed to buses. This means that services like the 23 and 27 will be going via Waverley Bridge and St Andrews Square. My copy of Chrome has been refusing to print in Google Documents. The print preview doesn't work and I get a message saying that the Chrome PDF Viewer needs to be enabled. When I checked it was already active. I tried disabling and enabling it again, but that did not help. I then enabled the Chrome NaCl plugin and that fixed it. You will find it in the plug in list near to Chrome PDF Viewer. I suspect that this might be because the new preview system runs natively in the browser. Both stories are probably true as the song is based on an earlier Scottish Song The Braes of Balquhidder by Robert Tannahill (1774-1810). This earlier song includes the lines "Let us go, lassie, go" and "And the wild mountain thyme". It is entirely possible (probable even) that McPeake learned this earlier song from his uncle and turned it onto the new song. The tune of Wild Mountain Thyme is completely different and unrelated to the older song. Will ye go, lassie, will ye go? All around the blooming heather. Grows around the blooming heather. The Braes of Balquhidder was written by Robert Tannahill (1774-1810). The earliest record of it is in Robert Archibald Smith's, "The Scottish Minstrel, a selection from the Vocal melodies of Scotland, ancient and modern", 6 Volumes, Edinburgh 1820-1824. This publication has two versions in Vol I, p. 49 and Vol. IV, p. 89. The latter is the same words, but to a different tune called "The Three Carles o' Buchanan". Smith knew Tannahill’s work well, having published an edition of his works separately. On the braes o' Balquhidder. Tae the bow'r o' my dearie. Wi' the light liltin chorus. Mang the braes o' Balquhidder. Are creationists guilty of blasphemy of the Holy Spirit? Some creationists believe that the theory of evolution is a work of the devil. See this Google search for some examples. This means that if they are wrong about creationism and God (Jesus) used evolution as a means of creation then they are describing his works works as the work of the devil. This is blasphemy of the holy spirit, which according to most Christian fundamentalists is the unforgivable sin. 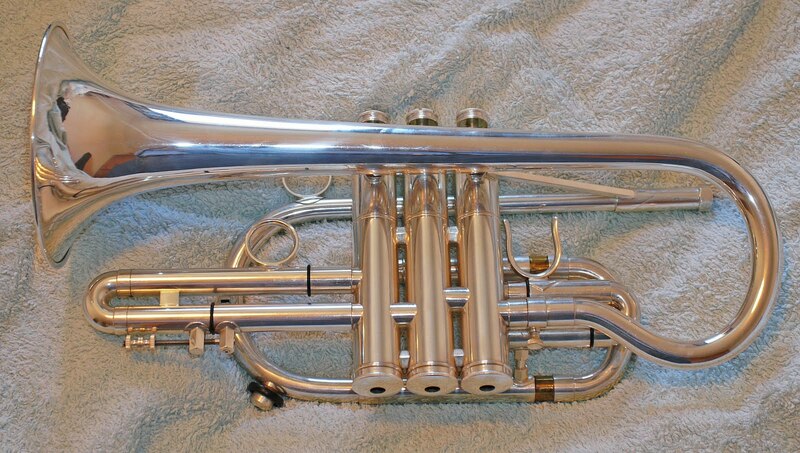 I am considering selling my Wedgwood cornet. This was made for me in 2003 by Denis Wedgwood. 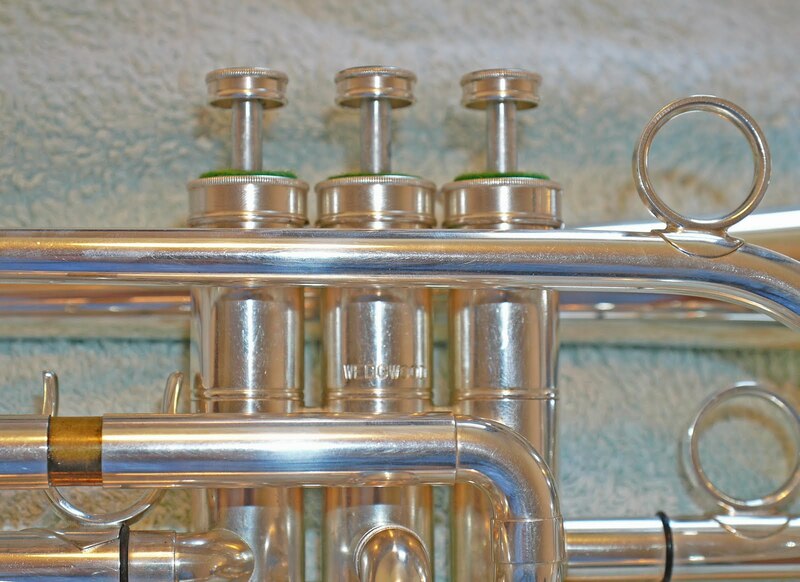 It is a superb instrument with a large bore and a very even response throughout. This cornet has been regularly played, but went back to Wedgwood for a service in 2007. There are no dents or damage of any kind although the valves are a bit stained (cleanable, but not worth doing). It has the original case with keys. 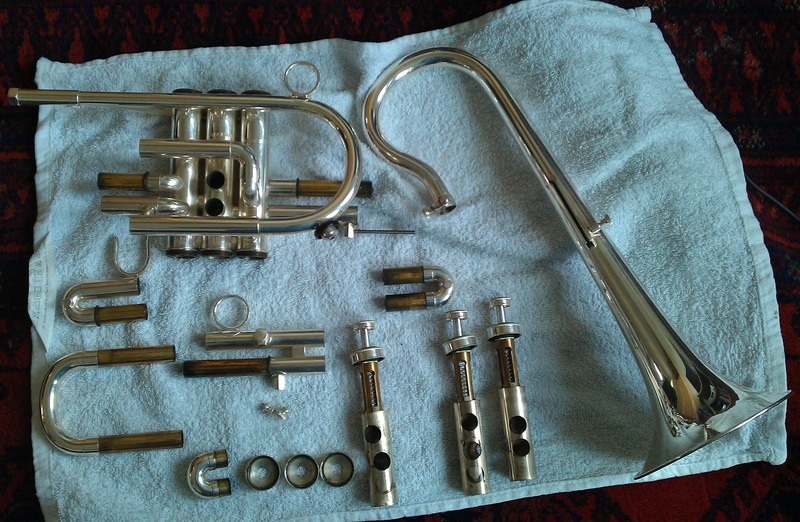 It has an interchangeable bell system and is supplied with one bell (the brass band model). 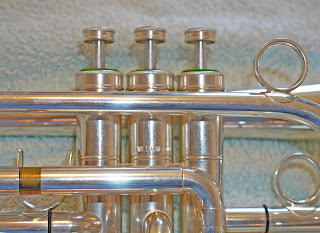 There is one water key (a Saturn water key, also designed by Denis Wedgwood) and a dump slide on the third valve tuning slide. These instruments are no longer made and they rarely come up for sale. The asking price is £2,000. I would prefer not to post it as its a bit fragile. I am located in Edinburgh where it can be picked up. Postage might be possible, but would need some thought. I will NOT sell it outside the UK so please don't ask.